We've all seen it happen: finding the motivation to actually make it to 6 a.m. boot-camp with a friend; nailing the last round of squats when you see those around you powering through; or pushing yourself to shave time off your personal record when you run a 5k race. There is something to be said about the power of working out in a group — but what is it about exercising with others that motivates us? Not only is group fitness having a moment, but it's having a significant impact on our health, too. Research shows that the healthy actions of others rub off on us. A study published in the Journal of Social Sciences found that participants gravitate towards the exercise behaviors of those around them. And a 2016 study published in the journal Obesity found that overweight people tend to lose more weight if they spend time with their fit friends — the more time they spend together, the more weight they lose. Which makes a pretty strong argument for making your workouts communal. But it’s just one of many reasons why it may be easier (and more enjoyable) to get fit in a pack. 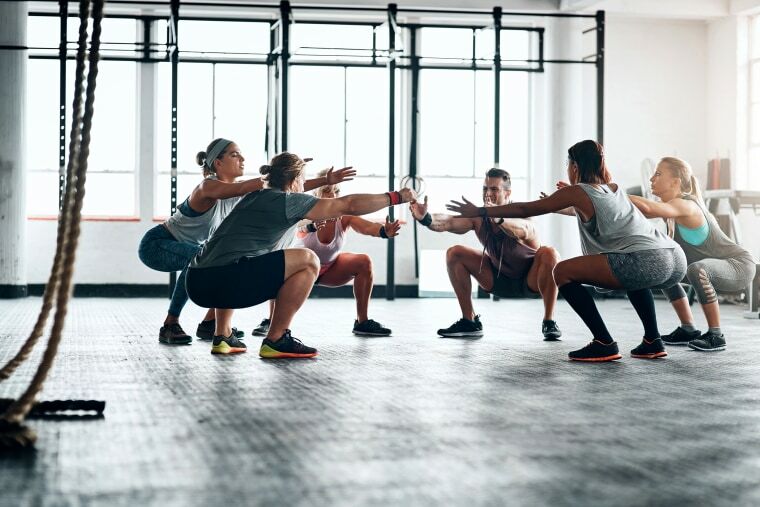 Whether it’s a group fitness class at the gym or a run in the park with some friends, here are some of the specific benefits you can glean from working out in a group. One study found that 95 percent of those who started a weight-loss program with friends completed the program, compared to a 76 percent completion rate for those who tackled the program alone. The friend group was also 42 percent more likely to maintain their weight loss. “For most people, it’s difficult to stay consistent with workout routines, but having a certain group there waiting for you provides you with the motivation and accountability everyone needs to be successful,” says Michael Yabut, Training Manager and National Trainer at TITLE Boxing Club International, LLC, who agrees that members of group fitness programs are less likely to skip workouts, which helps keep them on track. Push yourself harder: The Köhler Effect is the idea that no one wants to be the weakest link in a group setting. When it comes to fitness, this translates to pushing yourself harder when tasked with working out with people who are fitter than you. Those who exercised with a more-capable partner increased their plank time by 24 percent. It seems that opting for a group setting for at least a few workouts each week may help you push yourself past the threshold you tend to hit when working out solo — whether that be in time or intensity. Researchers at Kansas State University found that people who exercised with someone they thought was better than them increased their workout time and intensity by 200 percent. "We found that when you're performing with someone who you perceive as a little better than you, you tend to give more effort than you normally would alone,” says Brandon Irwin, assistant professor of kinesiology, and principle researcher in the study. “In certain fitness goals, like preparing to run a marathon, consider exercising not only with someone else, but with someone who is that much better. For an extra boost, consider some type of team exercise that involves competition, like playing basketball at a regular time throughout the week." A study published in the International Journal of Stress Management found that people who exercised on a stationary bicycle for 30 minutes with a friend said they felt calmer after the workout than those who cycled alone. And it’s also just more fun: Researchers from the University of Southern California found that people who worked out with friends (or a spouse or co-worker) said they enjoyed the exercise more than those who sweat it out alone. Add that to the list of reasons why working out with others may encourage you to make fitness a habit that sticks. That’s why some experts recommend sticking to cardio-based classes when challenging yourself in a group or partner setting, since strength training and high-intensity exercises are so personalized and can require individual instruction. “Having people around to push you can be a great thing, but it can also be a bad thing," warns Ford. "There’s a lot we can do in the moment when trying to keep up with or impress those around us, but it doesn’t mean that we should do those things or were capable of doing those things. Finding the right intensity level of a class and workout buddies is super important." The competitive spirit can also backfire if it encourages you to push yourself too far beyond your physical abilities. “There may be people who are more competitive than others and may compare themselves to others around them. Nothing is wrong with friendly competition, however, if these people don't listen to their body and understand their limitations, it can lead to injury,” says Wong. Learning the basics is also important to feeling comfortable in class: One study found working out with others in a mirrored room (like most yoga studios) made untrained women feel self-conscious and uncomfortable. “I would just emphasize to make sure that you find a group of people or class that fits your personality,” says Ford. So if you hate bike riding, perhaps a spin class isn’t for you. And if you’ve never boxed before, consider a training session one-on-one before jumping into the ring with a group. “Remember: It should be a fun time that is enhanced by the people around you,” Ford adds. And if it can be on the deck of an aircraft carrier in the Hudson River, even better.